The Stellar's sea eagles range is the coastal regions of northwestern China and Siberia, along Kamchalia peninsula and the Japanese islands. The habitat of Stellar's Sea Eagle is along coastal and forested river valleys where fish are plentiful. Roughly a 40 day egg incubation period and then 70 days to chick fledgling. 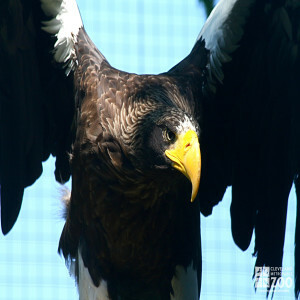 The Stellar's sea eagle's feeding behavior is to perch 5 to 30 meters above the water and then swoop down in a dive. They can also circle 6 to 7 meters above the water and dive. They can also stand in the water, on the bank or an ice floe to catch prey as well. Sexual maturity of Stellar's sea eagles is at about 4 to 5 years. The laying of their eggs occurs generally in the second half of April and early May, depending largely on climatic conditions. Courtship usually happens between February and March. Principally fish, but will take ducks and some small mammals.